Turkey and pumpkin can do good stuff together. Photo from Whole Foods Market. With all of the pumpkin pie, pumpkin cake, pumpkin puree, pumpkin butter and pumpkin whatnot on the table, don't forget Pumpkin Turkey Chili. Pumpkin is one of four superfoods that has been suggested for the fall. Though fall is half over and winter is due on 21 Dec., it is not too late to heed this counsel, especially now that it is holiday eat anything, anyhow, anywhere time. "Superfoods are brimming with nutrients and antioxidants,” says Kari Kooi, a registered dietitian at Houston Methodist Hospital. “The benefits of adding them into your everyday meals are numerous." That also goes for Pomegranates, Kiwis and Pumpkin Seeds. More on those later. 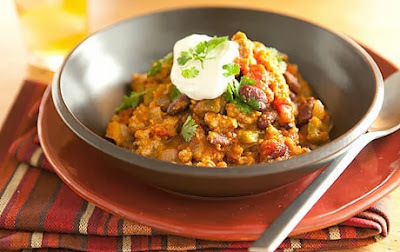 For now, salivate over the chili recipe. 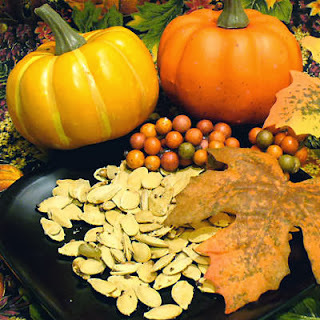 Don't let them go to seed, eat bone-strengthening pumpkin seeds. Archive image.